A few weeks ago, we welcomed representatives from some impressive 28 FLOW Exchange and Follower Cities to workshops in Munich. We are delighted to see that our partner cities are eager to get involved and engage in the FLOW workshops on modelling and impact assessment. The FLOW consortium strongly believes that the exchange of experience between local practitioners can support the take-up of effective congestion busting walking and cycling measures. FLOW's online learning platform therefore provides access for many more professionals interested in assessing the congestion impact of walking and cycling measures. We look at this through macroscopic and microscopic modelling as well as the impact assessment tool developed in FLOW. Read more about the upcoming e-courses and webinars in this newsletter! Our next highlight will be the world's largest cycling conference, Velo-city, from 13 to 16 June in Arnhem and Nijmegen (NL). FLOW will launch a new video at the conference and a collection of 15 'Quick Facts' on how walking and cycling measures have reduced congestion around the world. FLOW will also participate in the CIVITAS Forum Conference in Torres Vedras, Portugal, on 27-29 September 2017. We will join forces with the related CIVITAS projects TRACE and EMPOWER and hope to meet many of you and one of the upcoming events! To stay up-to-date on the latest news and developments in FLOW, please sign up to receive our newsletter at www.h2020-flow.eu and follow us on Twitter at @FlowH2020! For now, we wish you a pleasant read! FLOW Online Market Catalogue now available! The FLOW Online Market Catalogue is now available on the FLOW website! This catalogue provides you with descriptions of services, case studies and contact details for 30 companies from across Europe that are working to offer cutting-edge walking and cycling-related products and services. Meet FLOW at the Velo-city Conference! Velo-city is the annual global cycling summit - and this year it comes to Arnhem and Nijmegen, the Netherlands, from 13-16 June. On 27 April 2017, FLOW partner PTV welcomed the FLOW Market Forerunners and FLOW Exchange Cities at their headquarters in Karlsruhe, Germany. FLOW webinars and e-courses - register now! Join our interactive learning community of transport planners in cities and consultancies across Europe. 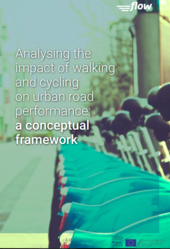 Flow project has recently released a new publication titled "Analysing the impact of walking and cycling on urban road performance: a conceptual framework" which introduces you to the tools that are being developed by FLOW. The Wuppertal Institute leads FLOW's Work Package 1, in which a multimodal methodology was developed that evaluates the impacts of cycling and walking measures on transport network performance and congestion. Creating places for people is the key idea of Munich's engagement in the FLOW project. Do you remember the largest cycling demonstration ever? It was organised in Budapest on 22 April 2008 Critical Mass / Earth Day, which attracted an estimated 80,000 cyclists. Lisbon wants to ensure enough time for pedestrians to cross all its intersections and reduce the risk of allowing cars to turn-on-red into crosswalks. Gdynia to participate in the European Cycling Challenge 2017! This is the fourth time that Gdynia (Poland) is taking part in the European Cycling Challenge, which runs from 1-31 May. It is a continuation of the effort undertaken within the CIVITAS DYN@MO project, where the city was intensively promoting sustainable modes of transport, with an emphasis on cycling. Driverless cars will cause congestion on Britain's roads to worsen for years. Driverless cars will cause congestion on Britain's roads to worsen for years because the vehicles behave too cautiously, according to a Department for Transport (DfT) study. Delays on motorways and major roads during peak periods are expected to rise by 0.9% when a quarter of cars are automated, researchers found. The Independent reports about British Labour Party politician Rob Flello, who describes himself as a 'cycle lane-sceptic'. Cycling UK encouraged Mr. Flello to visit cities in Denmark and the Netherlands to see how cycling can cut congestion. For a while, the parking chaos around the university hospital in Linköping was so bad that there was a risk that operations would have to be cancelled. Angry voices called for “more parking”, but instead the region of Östergötland chose to invest in sustainable transport. Today, there are 300 fewer cars per day that park outside the hospital, as Swedish consultancy Trivector reports. In this news item, you will find a selection of international events related to walking and cycling. Disclaimer: The sole responsibility for the content of this webpage lies with the authors. It does not necessarily reflect the opinion of the European Union. Neither the INEA nor the European Commission are responsible for any use that may be made of the information contained therein.